MSW student Shelby Smithson will begin serving a yearlong Fulbright in Turkey in September. Turkey, a country with next-level Southern hospitality. It reads like a tourism slogan, but UA graduate student Shelby Smithson can’t describe the country, its culture and its people any better. Like most Southerners, the Mobile native knows genuine kindness and hospitality. She experienced it firsthand when she visited Turkey for the first time last summer, spending two months learning the language, culture and social work infrastructure. Smithson, who will earn a master’s degree in social work on Friday, received a Fulbright scholarship and will return to Turkey in September to teach English. She recently took part in the long-running UA School of Social Work’s Washington, D.C. internship program, where she worked at the International Justice Mission, the world’s largest anti-slavery and anti-trafficking organization. She hopes one day to have a career as an international social worker and make her home in Turkey. Smithson’s travel passion stretches back to high school, when she first began international mission work. Smithson spent two months in Turkey last summer, learning the language and studying the country’s social work infrastructure. 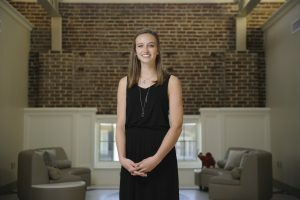 She completed a one-week medical assistance mission in Honduras prior to enrolling at UA, and a two-month mission teaching English to children in Central Asia the summer before her sophomore year. The trip to Central Asia allowed her to develop relationships with community members and immerse herself in a culture, aspects she didn’t experience during her snapshot of the poverty she observed in Honduras. 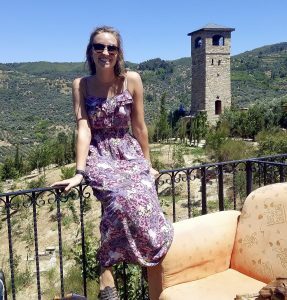 Smithson was keen to embed herself in Turkish culture last summer, hoping for a similarly rich experience from her previous service trip in Kazakhstan. In Turkey, she stayed mostly with UA PhD student and close friend Burcu Ozturk. Smithson said she began to learn more about trauma and international human rights violations while working on her MSW at UA. She completed a yearlong independent study with Dr. Debra Nelson-Gardell, associate professor of social work and coordinator of international programs, which focused on neurobiological effects of trauma, and another independent study on international social work. While at the International Justice Mission, Smithson worked with specialists to develop training modules for field offices across the globe and provide research to plan and manage their programs. Smithson worked specifically with the IJM’s aftercare team, which focused on restoring survivors of human trafficking and slavery and reducing their vulnerability. Throughout the spring semester, she developed training for the aftercare team’s new assessment tool and the accompanying guidance manual. On her final day at the IJM, she received a surprise opportunity to help train the British Red Cross. Internship experience aside, Smithson is grateful for the opportunity to work in D.C., an epicenter for public policy and international relief agencies. Networking was a built-in component facilitated by UA program coordinators, but students were encouraged to seek mentorships and professional relationships on their own. Smithson said she’ll likely have to build considerable work experience before returning to Turkey full-time, but her experiences in Washington D.C. have provided contacts and a blueprint for her return.